A lot of good anime aired in 2016, more than I am used to. In comparison, it feels like 2017’s new launches are underwhelming. However, when I go back 12 months, there’s only one show that started in January 2016 that I’d recommend to another human being, and that is Sekko Boys. 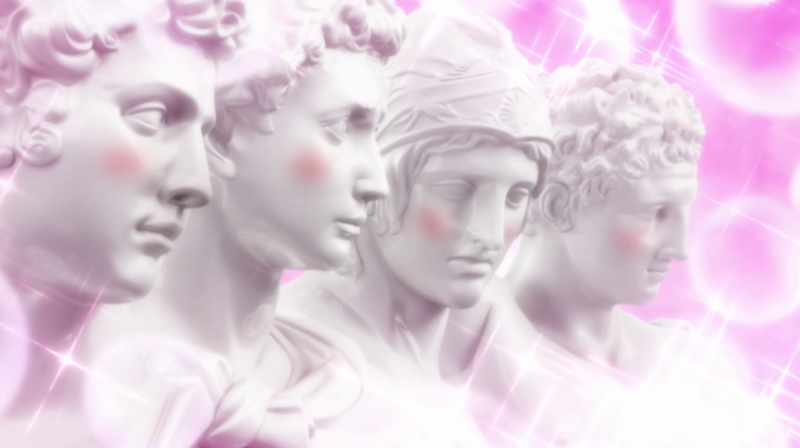 Sekko Boys presents the viewer with a pop group whose members are made up of the replica busts of four famous statues. These are the sort of busts that you frequently find in Japanese art schools. This is no mere whim, for the show is sponsored by Holbien, the art materials company. These busts possess the personalities of the subjects of the original statues. Namely, St George, Mars the god of war, Hermes, and Giuliano de’ Medici. The group is managed by an art student who had hoped to escape her former life. Instead, she finds herself having to physically haul four pieces of still life around the light entertainment circuit. It is an incredibly strange show. The strangeness is undercut by the matter of fact way all of this is treated by the people (and statues) in it. It is not interested in explaining the strange state of affairs, singing statues exist and everyone is fine with it. Prolific screenwriter Michiko Yokote was especially prolific last year, but this is one of the strongest and strangest of her projects. If you’ve enjoyed her work on Mr. Osomatsu or The Disastrous Life of Saiki K. of late, then don’t over look this. And if you’re a voice actor fan, it has Tomokazu Sugita, Daisuke Ono and Jun Fukuyama as three of the statues. Shinnosuke Tachibana rounds things out as cheeky young Medici. With each episode running 10 minutes long, you can get this wrapped up in a couple of hours over at Crunchyroll.